The section had questions dominated by Arithmetic. Questions ranged from topics like Percentage & its application, Numbers & its application, Ratio & its application, Set Theory, Time & Work, Time-Speed-Distance, Permutation and Combination, and Mensuration. There were around seven questions on Data Interpretation, which were easy. Overall the section can be classified as Easy to Moderate. A well-prepared student would have attempted all questions by spending 40 minutes and with 80% accuracy. Good score in this section could be 32+. This section was dominated by Vocabulary based questions. Types of questions ranged from conventional areas of vocabulary like Synonyms, Antonyms, Analogies and idioms. There were around 11 questions based on synonyms and antonyms, 3 questions on idioms and phrases and 5 questions on analogies. So, almost 50% of the section was based on the application of Vocabulary. There were two passages in Reading Comprehension portion. One passage had 4 questions while another had 5 questions. Both the passages were lengthy (approx. 400-450 words), but the questions were direct. So, a well-prepared student could answer most of the question without having to read the entire passage. There were few verbal reasoning based questions like Statement and Arguments. Overall the section can be classified as Moderate to Tough. As there was good number of questions based on vocabulary, overall time spent could not have been more than 30 minutes. A well prepared student would have attempted 32+ questions with 75% accuracy. Good score in this section could be 24+. This section was the most surprising as it did not have many questions on current affairs. Around 80 percent of the questions were based on Static GK. These questions ranged from topics like History, Important Days, Country and Currency, Dance forms, Abbreviations, etc. Geography questions like w largest ocean, largest continent, capital of Greece were very easy. Very few questions on current affairs would have disappointed a lot of students who were tracking updates on latest events. Overall, this section can be considered Easy to Moderate. Good attempts in this section could be 30+ while good score could be 22+. Note: As there was not negative marking, lot of students would have attempted all questions. The suggested good attempt and good score are the net genuine attempts and score obtained from it. Team EndeavorWishing all the students a great luck for results and for next stage of admission !Cut-offs: It is very difficult to predict exact cut-off for each college as the number of applicants is yet not disclosed. But different colleges considering SET General scores may consider the score in the range of 70 to 100. Students wishing to apply to any of the above mentioned colleges must apply to the respective college before the results are declared. Visit: http://set-test.org/payment.html for more details. 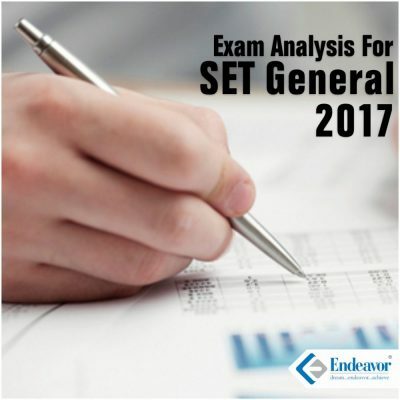 You can check the Video Analysis of SET General (BBA) 2017 here.